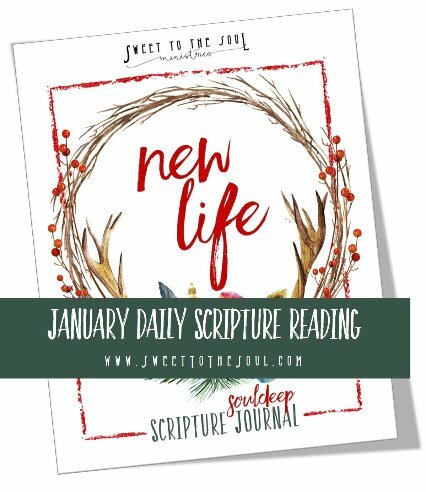 Welcome to day 1 of our #souldeep scripture reading for 2016! I am so excited to be on this journey of diving soul deep into God's Word - and even more excited that you are joining me! Our goal is simple - to spend time with God in His Word every day. Morning, evening, lunch time or afternoon break - the hour on the clock isn't what matters, it's the time spent in fellowship with our Heavenly Father. To encourage your time in God's Word, each morning we will post the days scripture with a beautiful graphic as well as sharing thoughts and reflections from our wonderful group of blog contributors, on our Sweet To The Soul fb page and in our Soul Friends fb group. And we would love for you to add your reflections as well. Please join the conversation! Then on Fridays, we will share a teaching right here on the blog. 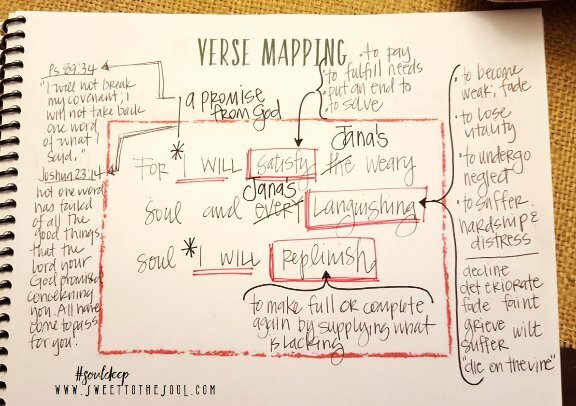 Today, for our first blog in the series, I wanted to spend a little time sharing about how I use the #souldeep Scripture Journal. But I hope you take these journal pages and truly make them your own. When I get into my Bible to study, I am a digger. I really enjoy diving in and searching for other scriptures on the same topic and cross-referenced scriptures that give more insight. My most important tools are my everyday Bible (ESV), my ESV study Bible and my phone. Yes, my phone. ​1. First, I begin with prayer seeking God's guidance for discernment and understand of the scriptures. I ask for His enlightenment of the particular teaching He has for me in His words. 2. I look up the days scripture in my everyday Bible and read the verse in context; meaning, I read the scriptures preceding and following the days verse. This may even include the full chapter depending on the setting or situation. 3. Then I look up the days scripture in my study Bible and read the commentary offered for the specific verse as well as the surrounding scriptures. If I am not familiar with the particular book of the Bible, I even refer to the general commentary and notes about that particular book of the Bible. 4. If cross-referenced scriptures are given in the footnotes, I go through these two steps with each of these scriptures as well; reading the scripture, reading the scriptures in context and reading the commentary for each scripture. 5. Then I go to my phone. I could use my laptop computer for this step, but I find it actually distracting. I like the smallness of my phone because I can keep my main focus on my Bible. So on my phone, I look up the days scripture in other translations. I love BibleHub.com for this as it will list several translations on the same page. They also offer additional commentary notes following the scriptures. I may also do a general internet search on the scripture or topic to find blogs or articles which have been written using the scripture. 6. Next comes I think my favorite part, this is where all of the digging becomes personal. In every scripture I read, there always seems to be a word or phrase that just jumps out at me. So when that word appears, I look up the definition and see which additional words or phrases really speak to me. 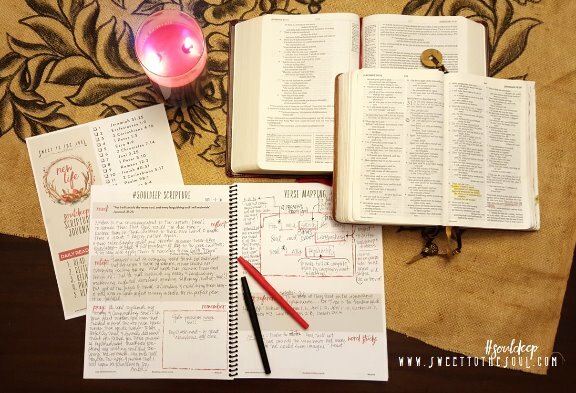 All of theses steps led me to create the specific sections included on the #souldeep Scripture Journal pages. Two full pages to journal our learnings from each days scripture. Personalize it: replace words like “you”, “we”, “us”, “them” with your name. Mark, circle, underline, highlight words and phrases that stand out to you. Any words make you want to dig deeper? Look up and define any words that need clarification. Read the verse in context: read the preceding and following verses or whole chapter. See how it ties in to the verses before and after it. Read the verse in other translations: note which words or phrases help you understand or apply the verse. Cross-reference the verse: find, list and read other verses which speak about the same topic. ​I am by no means an expert in Bible Study, in fact, I have found myself surfing on the surface more than diving deep. But I've been praying for God to give me a desire for His Word. I would love to hear about your journey through God's Word. What are some of your study practices? Do you have some favorite resources? ​Let's jump in the Bible together this year, and dive #souldeep. Wow Jana this is beautiful and looks like a great study format for those who want to go deeper!!! Looks great! I have read the bible through several times with our church plan, but long to 'dig deeper' into God's word. Thank you so much for your reading plan...think I will try it. Barbara, my goal really is to be able to draw more out of what is being read, and sometimes that is just easier to digest in smaller chunks. Thanks for joining us on this journey. Love. Love. Love! I followed the link back from Betsy's post over at #livefree. So glad I did Jana! 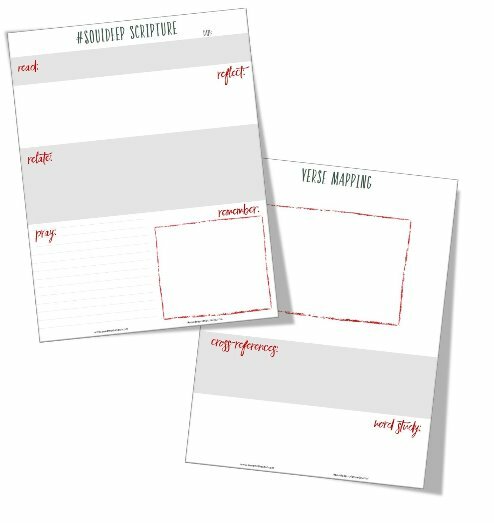 I journal but I know I will be utilizing these tools. Thank you for sharing...as always your words are SWEET! 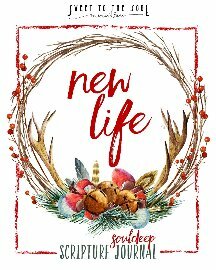 I am new to journaling, have purchased and downloaded your journal. I am purchasing a new journaling bible as well. Can't wait to dive in. Thanks so much!